When Mike Mittler awoke this morning and picked up his phone, there was a text message waiting. It was sent at 4:38 a.m. Central Time. It was from Jamie McMurray. Mittler said that, as much as anything that has been spoken or written about McMurray, says it all about the kind of person McMurray really is. He said McMurray, and Carl Edwards and the other drivers Mittler has helped over the years, have remained close and approachable even as their careers have carried them to Sprint Cup stardom and the distractions that come with that territory. “That’s the real deal,” Mittler said of his relationship with McMurray, who exchanged other texts with him during Speedweeks. McMurray, like Edwards, got his big NASCAR break when Mittler let him drive his truck in the Camping World Truck Series. Mittler said he first came to know Jamie McMurray through McMurray’s father Jim, whom he’d known from racing trade shows. “He’d always update me on how his kid was doing and show me photos from their racing,” Mittler said. Although he offered to put the youngster in a truck earlier, he waited because Jim McMurray figured his son wasn’t ready for what could be his one shot at the big time. But as McMurray advanced to Late Models on the Missouri short tracks, Mittler began to see for himself how good the youngster was. “He was beating up on Larry Phillips on a regular basis,” Mittler said. And anyone who could hold their own against the legendary Phillips was worth taking a chance on. So Mittler put McMurray in his truck, starting out with a 1999 race at a track they were both familiar with – I-70 Speedway in Odessa, Mo. Although his 24th-place finish didn’t create much of a stir at first, it was in Mittler’s trucks that McMurray proved to the NASCAR world that he was ready to advance to better funded teams. But Mittler said that no one owes anyone when it comes to his relationship with McMurray and with Edwards. For his part, McMurray said leaving Mittler’s team to move up in racing was the hardest thing he’s ever had to do. But that didn’t affect the personal relationships with Mittlers, something the Mittlers seems to value more than the racing connections. Mike Mittler said McMurray was especially close to him and his wife Bev when he was driving their truck, even eating meals at their house on a regular basis. In an interview last year, McMurray revealed just how close he was to the Mittlers. “He was my friend more than my owner, he and his wife Bev,” McMurray said. “When I worked there, I lived in his parents’ cabin. 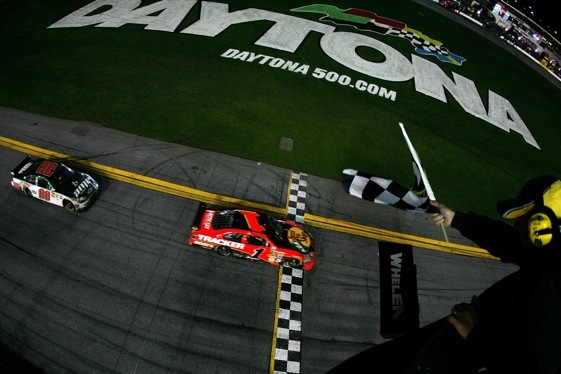 I drove his [personal] truck part of the time…..
Mittler said that when McMurray crossed under the finish line to win the 500, his wife was as emotional back in Missouri as McMurray was in Victory Lane at Daytona. “She was in tears over that,” he said.